A new Innovation Generation grant from the Motorola Solutions Foundation will help Array of Things expand its educational curriculum to additional Chicago Public Schools classrooms in 2018. Building upon two successful years of workshops with over 300 students at Lane Tech High School, the program will train teachers and package materials for a hands-on experience with the Internet of Things, coding, data science, and other key computer science and technology concepts. For the second year running, Array of Things worked with Chicago’s Lane Tech High School on a workshop curriculum called “Lane of Things.” Over eight weeks, students in Lane Tech’s Innovation and Creation Lab and Physical Computing Lab worked with scientists and designers from the Array of Things project on designing and building their own sensor boxes. Teams then deployed those boxes around the school, collecting data on foot traffic, air quality, noise, student behavior, and more. As the Array of Things takes its final steps toward its public launch later this summer, it has locked in two new relationships that will support its research and education goals. Through an Innovation Generation grant from Motorola Solutions, the Array of Things (AoT) team will expand the high school curriculum built around the urban sensing project last year at Lane Tech High School, enabling more students to learn about technology, programming, and other important skills through the platform. Meanwhile, a new agreement with AT&T establishes the company as the wireless provider for the AoT nodes, transmitting terabytes of data to storage. 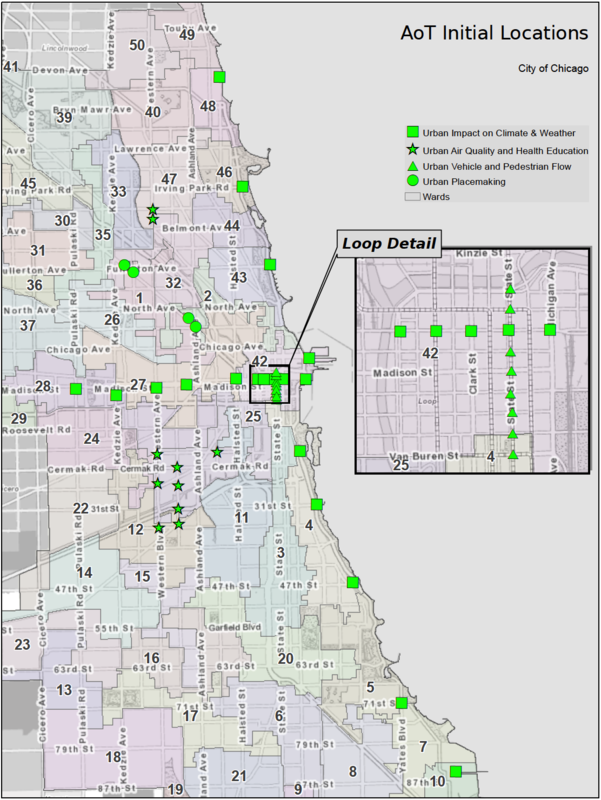 The first University of Chicago Convening on Urban Data Science, organized by the CI’s Urban Center for Computation and Data (UrbanCCD) and the UChicago Urban and sponsored by the Harris School for Public Policy, reflected this early stage of growth. There was ample enthusiasm about early projects using analytics, sensing, mapping, and both public and private data sources. There was excitement about the future and new collaborations formed across countries, disciplines, and public/private/academic spheres. But there were also passionate discussions about the ethical and moral implications of urban data science, an important reflection for a fast-growing field with the goal of improving policy and people’s lives.